‘Tis the season, so in that spirit, we’re joyously giving away two prizes to the winners of this month’s top five – your favorite holiday foods/drinks. This month’s entries were fascinating, perhaps more fascinating than usual because the unique choices allowed us a small but intimate window into your lives, especially those that came with explanations of the traditions. Of course, there were also the inexplicable traditions, like Rachel (S[d]OC) and the case of the holiday cheese grits, jensenly’s Christmas fondue, and Heather’s English summer trifle. But, thanks to all who entered and shared with us their holiday traditions, likes and dislikes. Happy holidays to you all and best wishes for a healthy and delicious New Year! PS. Your “Follow us on Twitter” button is broken. I think I have to check out Joe. I love the Seven Fishes thing. angela: THANKS so much for the head’s up – we’ll have it fixed today. Thank you! 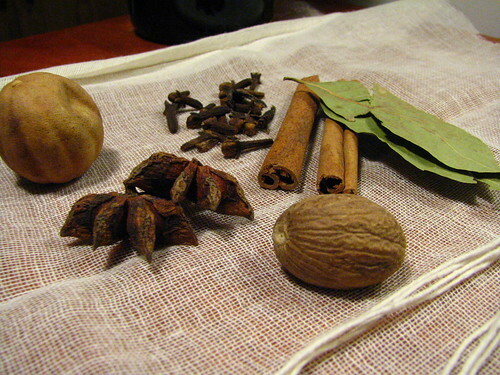 I’m psyched for the mulled wine spice mix!! I assume you guys aren’t taking responsibility for any drunken acts? Your web site is delightful! May seem off-topic, but where did you take the photos for this post? I notice the ‘parapluie’ poster and other iconic images in the background. Looks nice! Kudos for all your efforts here. Ciambellina – benvenuto al nostro blog and thank you for the the compliment! 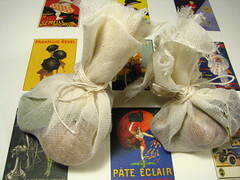 The background for the smaller pic is (sighs, reveals trade-secrets) actually a calendar with the art deco advertising that I just placed the mulling spice bags on to make the shot more interesting. We (as I think you do from quickly checking out your site) love these kinds of ads so it was fun sneaking them randomly into a post. I think we’ll be visiting your site to brush up on our Italian! Congrats to all of the winners, BTW, the stuffed porkloin…I’m drooling! Thanks for the shoutout. Those grits are inexplicable, but they are good. Mom is making them this year too.